The apple of his black eye. Jack and I had a fantastic wedding over the weekend with lots of romantic and redneck (at times) moments. When Jack and I were getting back together, he did a heck of a job courting me. 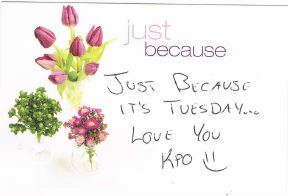 He bought me flowers and Midol when I was “under the weather”, made me some mean breakfasts (he still does this), and wrote me love letters on sticky notes. 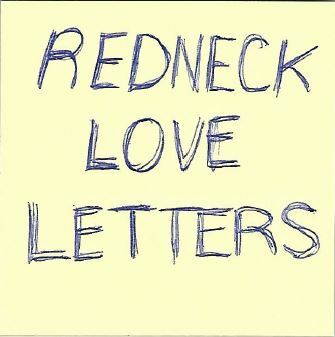 Here are a few mildly romantic, and 100% redneck love letters I have tucked away. They STILL make me smile. Profanity warning: I’ve married a sailor. Yes, that IS a bow and arrow.
. . . What the? Again, I apologize for my husband’s lack of filter. 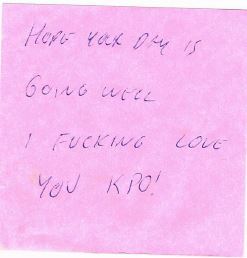 He just really “F’ing” loves me, and I love him too! Kindergarten-level drawing skills and all. 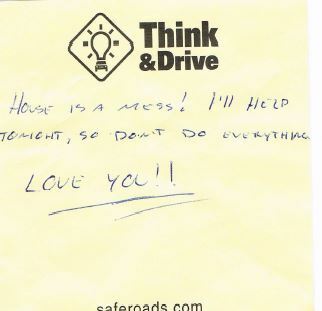 This Post was posted in Housewife, Humor and tagged housewife, humor, lady leisure, love, love letter, marriage, Redneck. Bookmark the permalink.